Sara Hurley, the new Chief Dental Officer for England, has visited Plymouth University Peninsula Schools of Medicine and Dentistry and the Peninsula Dental Social Enterprise to see first hand how those two organisations are spearheading advances in dental education, research, community engagement and care. Sara began her visit with the Peninsula Dental Social Enterprise and its role in raising awareness of oral health issues, improving access to dental care for those in most need and providing community-based engagement for dental students in the region. Later she met members of the Community Engagement Team who described to her their work and who highlighted innovative projects – such as the Open Wide Step Inside immersive vision animation and supporting material for primary school children and their teachers, and the award-winning dental ambassador scheme for adults with physical and learning disabilities. 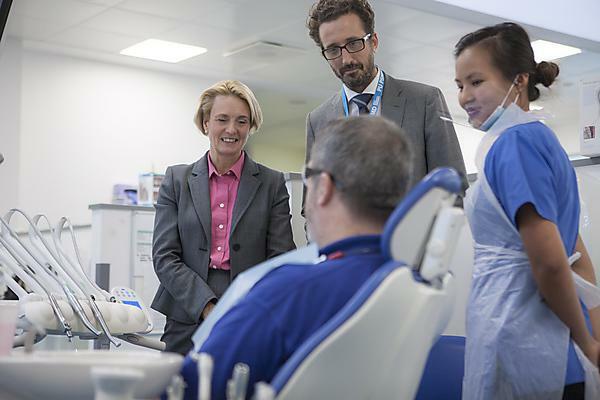 Her tour then took her to the Life Skills Resource Centre and the Simulated Dental Learning Environment, where she met Year 1 dental students and saw them honing their clinical skills using state-of-the-art simulated learning technology. A meeting with dental researchers, where projects and the future of dental research in policy were discussed, was followed by a visit to the Derriford Dental Education Facility (DEF). The Derriford DEF is one of four in the South West – two in Plymouth and one each in Exeter and Truro. Run by the Peninsula Dental Social Enterprise, DEFs are where dental, dental nurse and hygiene and therapy students treat NHS patients under the supervision of qualified dental professionals, as part of their studies. Here, Sara met with students, clinical supervisors and patients in a busy clinic.